Azukia mungo (L.) Masam., Phaseolus hernandezii Savi, Phaseolus max sensu auct., Phaseolus mungo L., Phaseolus mungo L. var. radiatus sensu Baker, Phaseolus radiatus Roxb. non L., Phaseolus roxburghii Wight & Arn. (ILDIS, 2009). Black gram (Vigna mungo) is a different species from mung bean/green gram (Vigna radiata). Both species are similar and are sometimes called by the same vernacular names (see Description below). Black gram (Vigna mungo (L.) Hepper) is an erect, fast-growing annual, herbaceous legume reaching 30-100 cm in height. It has a well-developed taproot and its stems are diffusely branched from the base. Occasionally it has a twining habit and it is generally pubescent. The leaves are trifoliate with ovate leaflets, 4-10 cm long and 2-7 cm wide. The inflorescence is borne at the extremity of a long (up to 18 cm) peduncle and bears yellow, small, papilionaceous flowers. The fruit is a cylindrical, erect pod, 4-7 cm long x 0.5 cm broad. The pod is hairy and has a short hooked beak. It contains 4-10 ellipsoid black or mottled seeds (Ecocrop, 2011; Jansen, 2006). Many Vigna mungo cultivars exist, each one adapted to specific environmental conditions. Early maturing, disease resistant and easily cultivated cultivars have been obtained (Jansen, 2006). Vigna mungo resembles green gram (Vigna radiata (L.) R. Wilczek) with two main differences: the corolla of Vigna mungo is bright yellow while that of Vigna radiata is pale yellow; black gram pods are erect whereas they are pendulous for green gram. Black gram is somewhat more hairy than green gram; the white hilum also protrudes from the seed. Black gram is sown on heavier soils and green gram is sown on lighter soils (Göhl, 1982). Vigna mungo seeds are mainly a staple food and the dehulled and split seeds (dhal in Hindi) are a common dish in South Asia. They can be ground into flour and used for making papadum, a typical Indian flat bread (Jansen, 2006). Seeds, sprouts and green pods are edible and much appreciated for their high digestibility and lack of flatulence induction (Jansen, 2006; Fery, 2002). The seeds are normally too expensive to be used as a feed, even in areas of primary production (Rajaguru et al., 1985). The by-product of dhal processing (chuni or bran) constitutes about 15-20% of the seed weight and comprises hulls, germs and broken seeds. Chuni is a potential feed resource and large quantities are available in India and other Southern Asian countries where black gram is a popular food (Reddy et al., 2000). Vigna mungo is also grown for forage and hay (Göhl, 1982). Its crop residues are an important feed for livestock in some regions of India (Sandeep Saran et al., 2000). Fodder is derived mainly from the leaves and stems, but seeds, pods and pod husks are also used. Vigna mungo is usually fed to cattle as a fodder but the plant, the seeds and the by-products are also consumed by other species (Fuller, 2004). Vigna mungo can be used as cover crop and green manure (Jansen, 2006). It is often used as dry season intercrop in rice or wheat as it has a beneficial effect on soil nutrient status (Parashar, 2006). The main producer of black gram is India, which produces about 1.5 million t of seeds annually (Sharma et al., 2011). India consumes its entire production. The other main producers (Myanmar and Thailand) are the major exporters. 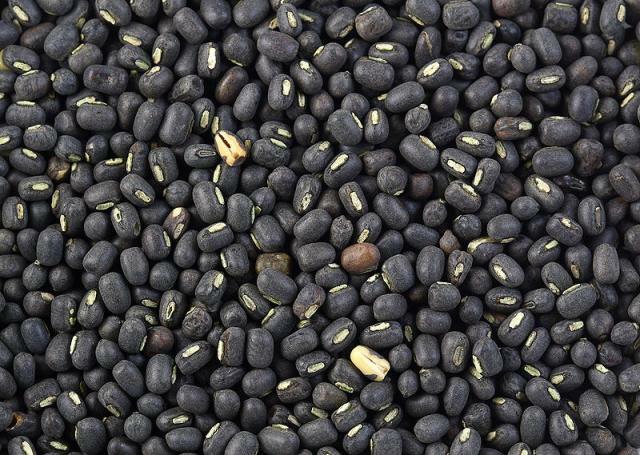 Globally black gram accounts for more than 40% of total legume seeds traded (CRN India, 2011). In India Vigna mungo yields up to 15.6 t green fodder/ha and 340-1500 kg dry seeds/ha have been obtained (Ecocrop, 2011; Saha et al., 1981). Dry matter yield is about 3 times that of seed yield (Duke, 1981 cited by Baligar et al., 2007). In Bangladesh, Vigna mungo intended for pasture is broadcast with another legume such as chickling vetch (Lathyrus sativus) in a no-tillage system. It is then rotationally grazed by cattle which should be offered straw to prevent diarrhea or bloat (Islam et al., 1995). Harvesting of Vigna mungo seeds can be done by picking the pods or by uprooting or cutting the whole plants. The crop residues (stems, leaves and empty pods) are then available for fodder (Fuller, 2004). Vigna mungo has a taproot. It is an N-fixing legume that improves soil fertility and soil physical properties (Parashar, 2006). Its cultivation does not require N fertilization but N fixation is improved by inoculation with local rhizobium strains (Sharma et al., 2011). Vigna mungo is responsive to P (40 kg/ha) and K (30 kg/ha) and only needs rough tillage and one or two weedings (Baligar et al., 2007; Jansen, 2006). Vigna mungo can be used in intercropping systems with legume species such as groundnut and cajan pea (Cajanus cajan), industrial crops (cotton, sugarcane) and cereals (sorghum, pearl millet, finger millet) as the main crops (Krishna, 2010; Jansen, 2006). It provides supplementary food to the farmers and nitrogen to the other crop. Associations with maize, groundnut or cajan pea can improve productivity of those crops by 42-53% (Krishna, 2010). In the dry season it is often sole cropped on rice fallow, before and after rice planting (Baligar et al., 2007; Jansen, 2006). In Vietnam, intercropping Vigna mungo with rice deprives weeds from residual water and thus provides an effective weed control (including against weedy rice) (Ferrero, 2005). Fresh Vigna mungo forage is rich in protein (18-19% DM) and fibre (crude fibre 25-27% DM; NDF 45% DM) (Göhl, 1982; Saha et al., 1981). Black gram straw and haulms have a variable composition, depending on the proportion of stems, leaves, pods, etc. Reported protein values range from 8.9 to 17.2% DM (Göhl, 1982; Reddy, 1997; Krishnamoorthy et al., 1995). NDF values are 54-57% DM (Reddy, 1997; Krishnamoorthy et al., 1995). Starch content is low (4.5% DM) (Singh et al., 2002). The seeds are rich in protein (24-26% DM) and starch (35% DM) (Rajaguru et al., 1985; Göhl, 1982; Wiryawan, 1997). The fibre content is inconsistent, with crude fibre values in the 5-6% DM range (Göhl, 1982; Wiryawan, 1997) or higher than 14% (Rajaguru et al., 1985). The major nutritional constraint with raw Vigna mungo seeds is their high content in condensed tannins and trypsin inhibitors. Chuni contains variable amounts of the seed coats and endosperm fractions. Some chunis are as high in protein as the seeds (26% DM, Krishna, 1985) while others contain less protein (15.4% DM) and more fibre (NDF 51% DM) (Islam et al., 1997). Vigna mungo seeds contain trypsin inhibitors and condensed tannins, sometimes in larger amounts than chickpeas, faba beans and peas. This could limit their use if they are not processed for feeding to monogastric species. However, experimental results are inconsistent (Wiryawan, 1997; Yamazaki et al., 1988). The seeds are free from glucosides (Göhl, 1982; Wiryawan, 1997). Vigna mungo grown as green fodder and fed to adult Red Sindhi cattle as the sole source of feed was found to be palatable. Dry matter intake was 18.4 g/kg body weight. The N balance was positive but the Ca and P balances were marginally negative. It was concluded that Vigna mungo fodder was nutritious but required mineral supplementation (Saha et al., 1981). In Bangladesh, some dairy cattle feeding systems are based on legume pastures, combining Vigna mungo and Lathyrus sativus herbage with copra meal-based concentrates. Supplementing such diets with straw (2.5 kg/h/day) did not change DM intake but increased milk production (up to 8.64 L/d) and was more profitable (Islam et al., 1995). Reported OM digestibility values in cattle varied between 57 and 73% (Harrison, 1942; Saha et al., 1981). The crude protein of Vigna mungo straw was found to be more degradabale to that of Leucaena leucocephala leaves (Singh et al., 2002). Dry matter is also highly rumen-degradable (Reddy, 1997). OM digestibility of the roughage was good (68%), and ME estimated from gas production (9.1 MJ/kg DM) was higher than that of rice straw and groundnut straw (Krishnamoorthy et al., 1995). However, using black gram straw as a sole feed ad libitum did not meet the nutritional requirements (and particularly the protein requirement) of Murreh Buffalo heifers (Sanjiv Kumar et al., 1995). Vigna mungo straw offered to sheep at 60% of the diet supported growth in sheep (average live-weight gain of 60-62 g/h/day), and was equivalent to wheat straw in terms of feed efficiency and feeding cost (Jadhav et al., 2001). There is no recent information concerning the use of Vigna mungo seeds in ruminants. Early research found the seeds to be relatively digestible in cattle (OM digestibility of 65%) (Sen, 1938 cited by Göhl, 1982). In India, black gram chuni was found to be palatable to buffaloes, and it was possible to include up to 40 % of chuni in the concentrate diets of male buffaloes also fed rice straw, with no effect on OM, DM and crude protein digestibility and with a positive effect on fibre digestibility (Reddy et al., 2000). At a 40% level, the degradability of DM and CP was estimated to be 55.6% and 71.6% respectively (Reddy et al., 2002). In Bangladesh, black gram bran (100 g/d) given to goats fed fresh grass was found to be a potentially valuable supplement, resulting in a higher protein intake and higher weight gain (57 vs. 31 g/d in goats fed grass alone) (Islam et al., 1997). The inclusion of black gram chuni at the 15% level in the rations of growing and finishing crossbred barrows did not affect growth rate or carcass characteristics (Ravi et al., 1999). Vigna mungo seeds are not a common poultry feed due to their price (Rajaguru et al., 1985). The few reported ME values in poultry are not consistent (MJ/kg DM: TME 9.4; MEn 12.7; TMEn 13.3; from Wiryawan, 1997; Rajaguru et al., 1985; Yamazaki et al., 1988 respectively). Vigna mungo seeds were found in one experiment to have higher amino acid digestibilities than soybean meal (Yamazaki et al., 1988) but the opposite was found in another trial (Wiryawan, 1997). It is, therefore, difficult to estimate the nutritional value of Vigna mungo seeds for poultry. The inconsistent results may be caused by variations in antinutritional factors due to genetic or external causes. The lowest ME value was explained by the high content of condensed tannins of the particular seeds analysed (Wiryawan, 1997). Young broilers fed a diet containing 43% of black gram seeds as the sole protein source experienced severe weight losses which was attributed to the low protein content of the black gram seeds. Autoclaving for 5 to 20 min did not improve TME but TME and protein digestibility could benefit from specific enzyme treatments (Wiryawan, 1997). Black gram chuni could partially replace fish meal and maize grain in layer diets. However, diets containing 5 or 20% chuni resulted in a lower (but not significantly different) egg production, lower digestibility and lower N and Ca retention (Khulbe et al., 1973). Pod husks of Vigna mungo are an excellent alternative to rice bran as a feed for Artemia sp. in terms of survival, growth, fecundity, and production of nauplii (Yoganandhan et al., 2000).